Noetzie is one of those places that people remember! Archeological excavations of the Noetzie midden show that Noetzie has been a popular destination for the last 3,500 years. The earliest written reference to Noetzie was scribed on the 4th March 1786 by adventurer and captain of the Dutch East India Company (known then as the VOC) Colonal Robert Jacob Gordon who mapped a good part of South Africa. Many trips were undertaken through local, uncharted forests often for 6-8 hours a day by foot and horse and he made reference to the river mouth at Noetzie. Some seem a little disappointed to be told that the castles are no more than holiday homes, and a few mischievous Noetzie residents, playing up to visitor curiosity, have been known to spin them a yarn or two about the castles belonging to pirates, smugglers, the Portuguese under Vasco da Gama, or even as a little known Roman outpost. Many of the houses at Noetzie have been in the same family for generations and today’s youngsters swim, fish, scramble over rocks and frolic in the sand just as their grandparents and great – grandparents once did. The oldest house in Noetzie (including the castles) is “North’s Cottage”, a little wood and iron cottage that was built early in the 20th century, and which the fifth generation of North descendants still enjoy as a holiday home. 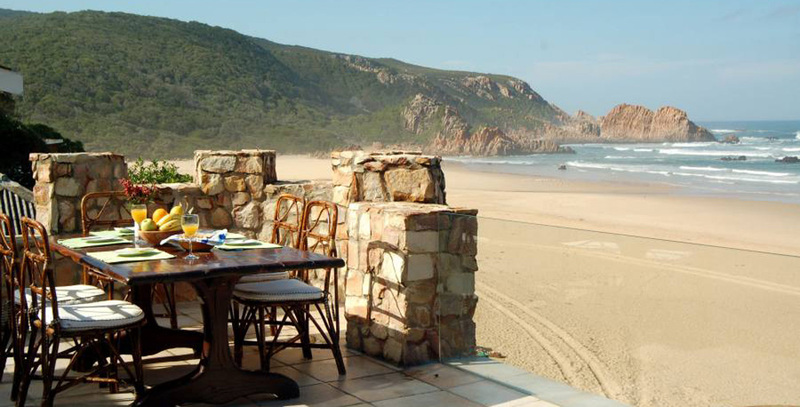 The oldest castle, at the end of the beach, was built as a holiday house by Herbert Stephen Henderson, who lived in what was then Southern Rhodesia. He started building it in 1930 out of the local natural stone . The story goes that he had no intention of building a “castle”, but simply used the stone for practical reasons, when Rex Metelerkamp, a member of a well-known local family, who was watching the building, jokingly said “All you need to do is to add a few turrets and you’ll have a castle”. And he did! That set the trend, and Pezula ,up on the hill, was completed in the late 1930’s, and became known simply as “The Castle” , in 1942. His son Ian built Montrose in the 1970’s and the Lindsays built “ Perekuil “, now known as Lindsay Castle, in the 1960’s.